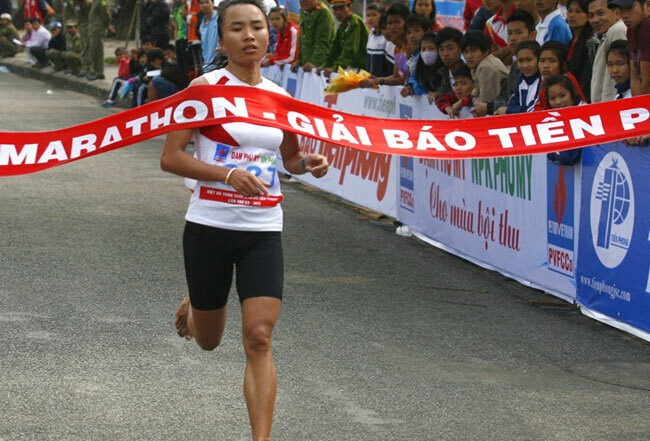 HA NOI (VNS)— Marathoner Pham Thi Binh believes she will have no rival at the Tien Phong Newspaper Cross Country and Marathon Tournament in Da Lat City on Sunday. "I have trained hard since early this year for the annual event. It will be my fifth time participating, but the first time I've entered the full marathon category," the SEA Games champion told Viet Nam News yesterday. The Quang Ngai Province-born runner made her debut at the 55-year-old competition in 2011, when she won a gold medal. In the next two years, the 23-year-old found it easy to defend her title in the 21km class. "Marathon is the most exhausting event in track-and-field. In Viet Nam, not many athletes are interested in it. Some young runners from various provinces have started practising marathon. But I think that there will be no threat to my first place this year," said Binh, who is the queen of the long-distance event in all national tournaments. This is the first time the most prestigious domestic running competition will feature the 42km event. "We first held a semi-marathon event in 2009 and now after five years we are pushing the run to a higher level by adding the full marathon event," said Nguyen Manh Hung, deputy head of the organising board. "Although we don't have many athletes competing in this event, we became the leading marathon country in the Southeast Asian region after (Pham Thi) Binh won the women's title in the recent 27th SEA Games in Myanmar. "I believe the Tien Phong Marathon will be an additional opportunity for our athletes, who in fact have not taken part in many tournaments, to get some practise. We have also sent invitations to regional federations, but because of budget shortages they could not compete. Hopefully we can welcome them next year." The 42km event is open to anyone, including foreigners. Participants can register with the Lam Dong Province Sports Department until this Sunday. Athletes will run around Xuan Huong Lake, one of the most popular sightseeing destinations in the Central Highlands city. More than 250 professional and amateur runners will take part in the men's and women's 3km, 5km, 7km and 10km. "Four years ago we successfully held a Viet Nam-Japan friendly run. This is the second time our city hosts the Tien Phong competition," said Nguyen Van Quang, deputy director of Lam Dong's Culture and Sports Department. "We have invited 80 referees, and police will ensure athletes and viewers' safety."